Do you need a Student visa or a Training visa? Australian visas are issued by the Department of Home Affairs. If you plan to study in Australia you need a visa. Depending on the type of study and the length of time you plan to be in Australia you may need a student visa, a training visa or a visitor visa. 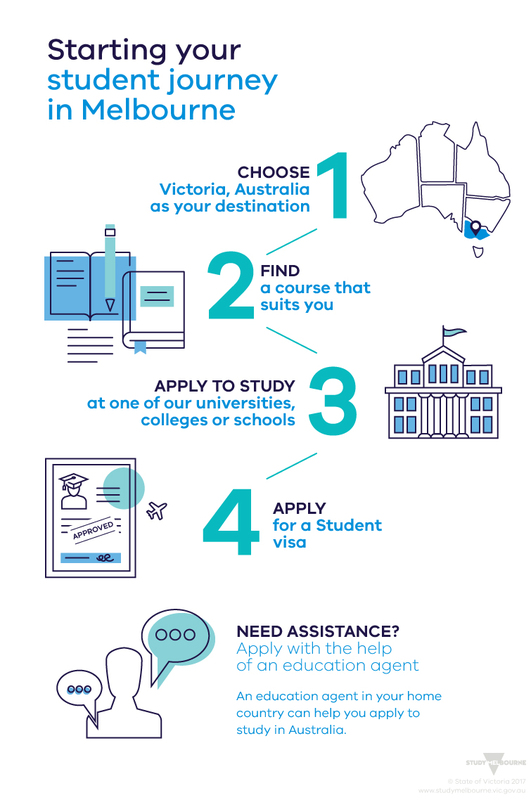 Visit the Studying in Australia page on the Department of Home Affairs protection website to find out more about which visa to apply for and how to apply. If you are in Australia call the Department of Home Affairs Helpline, available Monday to Friday 8:30 am to 4:30 PM on 131 881. Start by choosing Victoria, Australia as your study destination. Find a course that suits you then apply to study. When you have applied to study at your preferred university, college or school, apply for the appropriate visa, for example a Student visa. If you need help, an education agent may be able to assist you. You can also download this infographic in PDF format. The Student visa allows you to stay in Australia to study full-time in a recognised education institution. To apply for this visa you must first apply and be accepted to study in a registered full-time course at an educational institution in Australia. If you are under 18 there are additional requirements. Check the Student Visa page on the Department of Home Affairs website. Students under 18 who apply to study in Australia may also have a guardian. If you are the guardian of a international student under 18 who is here on a Student visa you may be able to apply for a Student Guardian visa. Find out more on the Student Guardian visa page on the Department of Home Affairs website. This visa allows you to do workplace-based training to enhance your skills in your current occupation, area of tertiary study or field of expertise. Find out more on the Training visa page on the Department of Home Affairs website. If you have finished your studies and want to stay in Australia temporarily to work, you may be able to apply for a Temporary Graduate visa (subclass 485). To stay in Australia for longer, you may need a working visa. Find out more on the Post study work arrangements page on the Department of Home Affairs website. When you apply for your visa, you may need to apply online. The Department of Home Affairs provides this information on the pages that relate to your type of visa. To apply online, you need to open an account with the department, called an ImmiAccount. For online Australian visas use ImmiAccount. Video by Border TV, the YouTube channel of Department of Home Affairs.